If you're a perkigoth with a good sense of humor (rather than a cranky eldergoth like me) you might bounce around in these adorable Tim Burton-themed hats this autumn and winter. Some people refer to this style of hat as a "Peruvian Beanie," others as a "Laplander." 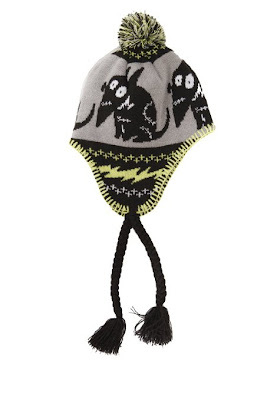 I prefer to think of it as the Frankenweenie Beanie because then it rhymes! 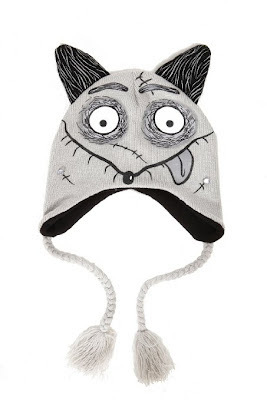 This other style of Frankenweenie beanie has a fuzzy pompom on the top for added goofiness. It's also sold on eBay. 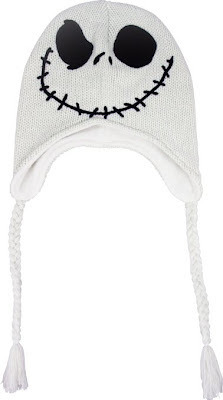 You can also keep your head warm this winter with a Jack Skellington laplander hat, in white. (Also sold on eBay. Or perhaps you'd prefer to wear it in black. (Also available on Amazon). 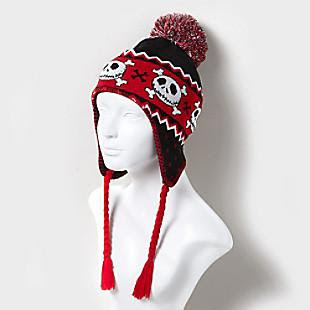 My favorite is the red, white and black Nightmare Before Christmas beanie. It just seems more visually interesting.